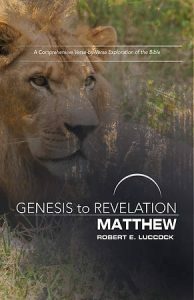 This study of the Book of Matthew follows Jesus from his birth through his life to his death and resurrection. Some of the major ideas explored are: dreams, do not fear, Lord help me, write your own parable, and this cup is My blood of the covenant. The meaning of the selected passages is made clear by considering such aspects as ancient customs, locations of places, and the meanings of words. The simple format makes the study easy to use. Newly revised, these Abingdon classics are based on the NIV translation and are presented in an easy-to-read format. This study is also available in large print. Please click HERE for information on the book. To sign up for this class, please fill out this short form below.